The first full season for the Buffalo Sabres with owner Terry Pegula began with high expectations after a busy offseason. A concussion for goaltender Ryan Miller didn't help, but several players had subpar offensive seasons and a team that was supposed to be among the elite in the Eastern Conference struggled for much of the campaign. There was a late surge, and the Sabres nearly squeaked into the Stanley Cup Playoffs (they finished in ninth place, three points from eighth). But Buffalo was one of the biggest disappointments in 2011-12, and general manager Darcy Regier made some alterations this offseason. When Boston Bruins forward Milan Lucic bowled over Miller in open ice, the team's lack of a sufficient reaction became the linchpin for a narrative about its lack of toughness. The additions could help in that regard, as would better health for Miller and Tyler Ennis. It's possible the Sabres take a big step forward a season later than many pundits expected. Under-valued: Tyler Ennis - Finished last season with 15 goals and 34 points in just 48 games and came on extremely strong at end of season with eight goals and 19 points in final 14 contests -- could break out with over 60 points. Over-valued: Jason Pominville - Posted just 52 points in 2010-11 before erupting for 30 goals and 73 points last season. Despite solid point production and shot total (235 SOG), his minus-7 and 12 PIMs didn't help fantasy owners. Sleeper: Cody Hodgson - Appeared to have a bright future with Canucks, but was stunningly traded to Buffalo where he struggled with just eight points and a minus-7 in 20 games. 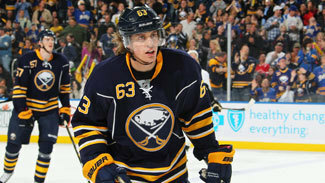 Expect a major bump in production as he'll likely start the season as the Sabres' No. 1 center. NOTES: The Sabres struck gold with the Foligno-Ennis-Stafford line near the end of last season, and leaving them together could give Hodgson a chance for a big role, though Ott could slide into a top-two spot at center if needed. Gerbe needs a strong start or he could get shuffled out of the mix after a bad 2011-12. Luke Adam was centering the "top" line early last season before being demoted; he could work his way back into a top-nine role with a strong camp. Much was made of the Scott addition, but it is hard to see him playing regularly without some injuries given the depth both up front and on the blue line. Buffalo has eight defensemen on one-way contracts plus promising Brayden McNabb and T.J. Brennan. Alexander Sulzer could end up in a battle with Pardy for a roster spot, especially if the team keeps a traditional 13th forward. Miller could have a big year if he's intent on reclaiming his status as the top American goaltender from Jonathan Quick of the Los Angeles Kings. If Miller does, Enroth could be back among that group of young backup goalies who might need a change of scenery to earn No. 1 playing time.